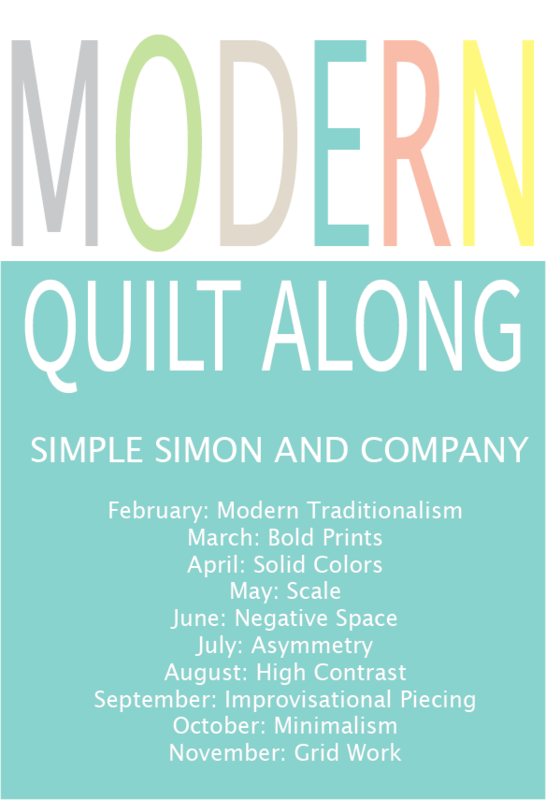 Welcome to the March addition to the Modern Quilt Along with Simple Simon and Company. 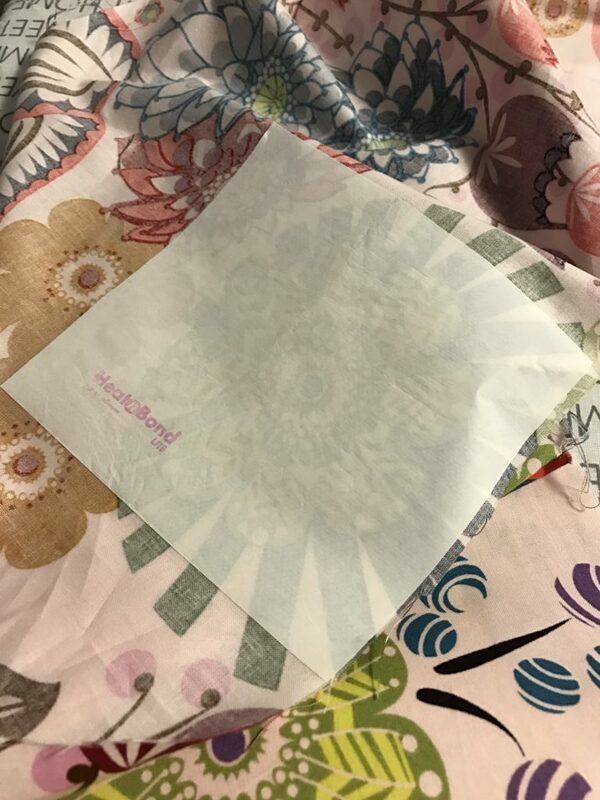 Liz and Elizabeth invited me to be part of their year long journey with Modern Quilting and I happily accepted. I took on the task of Bold prints and I won’t lie…that can be very a difficult task to take on. The bold prints draw us in and intrigue us. But then there is the task of actually using them. I’ll admit that I love to use bold prints for backings. I probably mainly use them in this way. They make the back of a quilt truly exceptional and just as important as the front. But for this quilt along I wanted to do something a little different. I decided to use the bold fabric in an applique setting. 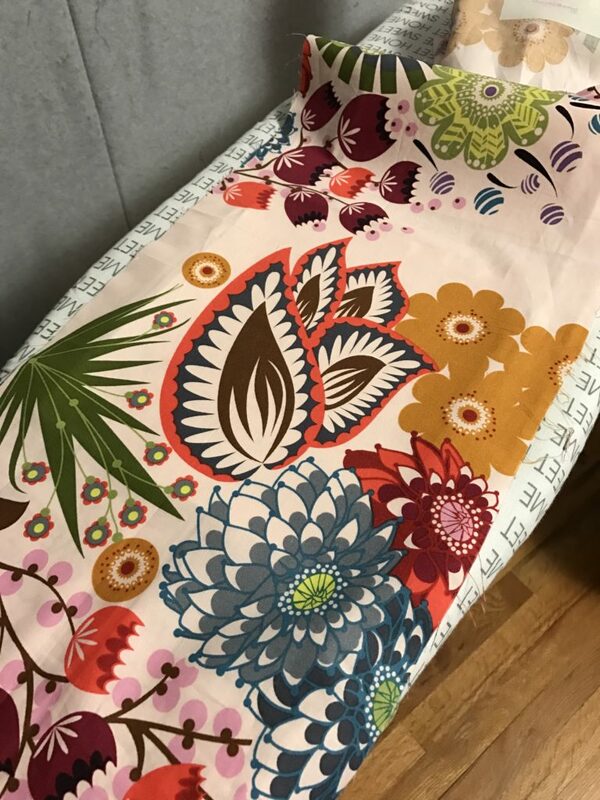 I chose an Anna Maria Horner fabric that I had left over from a great backing. She designs some of the best large scale prints around! 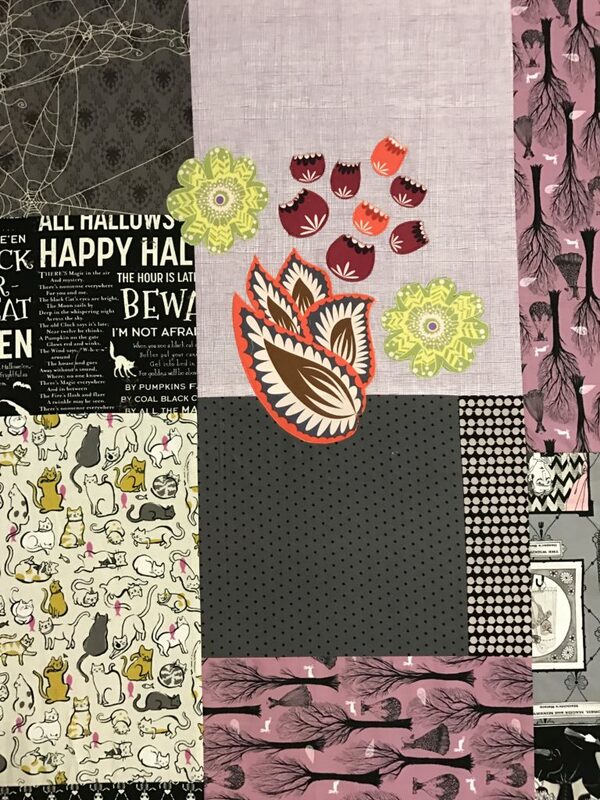 To use the fabric in an applique setting, I chose certain pieces from the fabric that I could cut out and reassemble on another quilt. I added heat n bond lite to the back of these for the applique application. 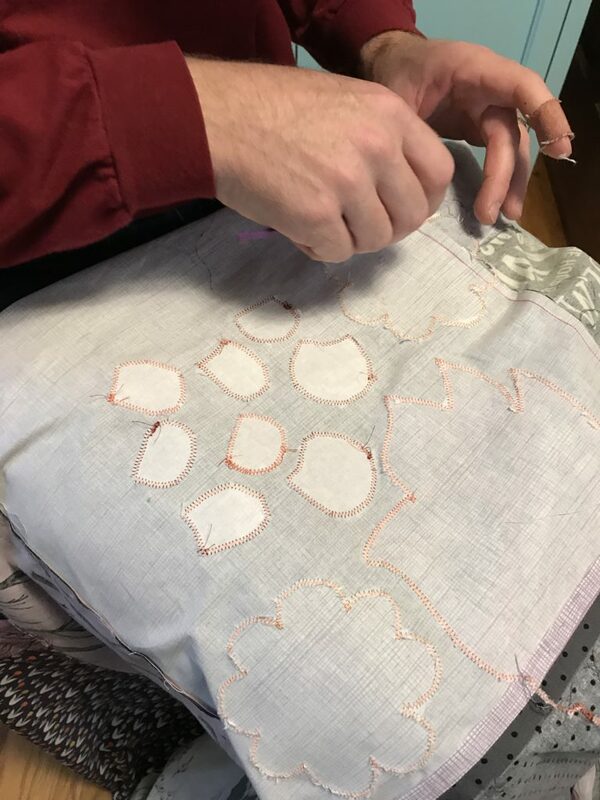 I cut out each piece from the fabric (you may want to use small scissors to do this depending on how complicated the pieces are). I then took them to a quilt top that I have been working with and laid them in a pleasing arrangement. I wanted the pieces to clearly be an addition to this top that is intentional. The top already has some large scale prints in it, but they are not appliqued. So this was an opportunity to add something new to the quilt. Then comes the slightly tedious part of appliqueing the pieces onto the quilt. I used a press n tear stabilizer on the back of the area where I would be appliqueing the cut out pieces. This helps maintain the integrity of the quilt top while I add so much stitching. I used a small zig zag stitch with a matching top thread for each piece and sewed around the edge of each piece. I didn’t quite do a satin stitch but pretty close. I intend for this to be a quilt top that is able to be washed, so I wanted the pieces attached well. If it was a wall hanging or other type of piece that won’t be washed then I would probably do a sketchy raw edge applique. Either way is fun! 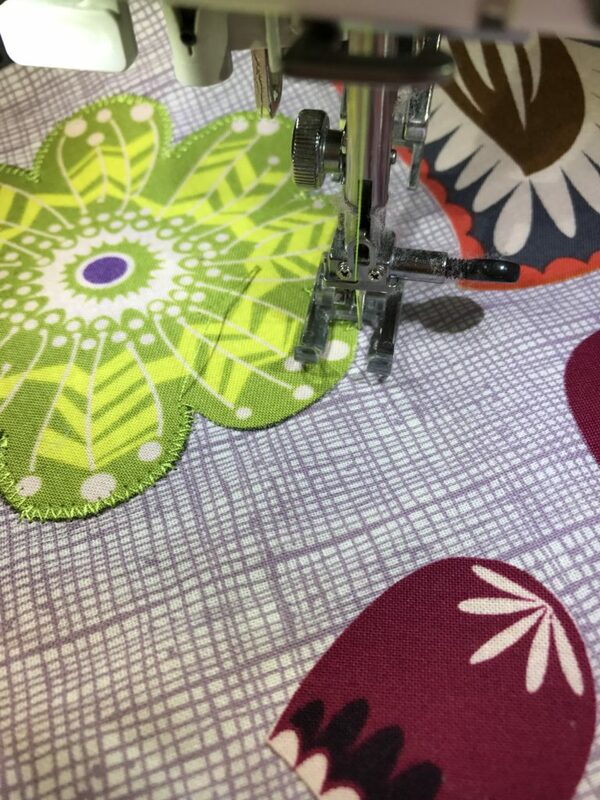 Just make sure that you use your open toe applique foot on your machine so that you can see where you are going. Next step: removing that tear away stabilizer. There are a lot of stabilizers out there, so feel free to experiment with what works best for you. Disolvable stabilizers are another great option here…they come out in the wash and then you don’t have to worry about removing them. And then you are done! You can step back and admire your work! You have taken pieces from one large scale print and cut them apart. Then you added them onto another piece in a new arrangement that is completely unique to you. Well done! Oh and it’s addicting, so get ready to do this more than once. Pretty soon you’ll be cutting up all of your prints to create your own new combinations and scenes. What do you think? Have you used a large scale print this way before? It’s a little scary to step outside the boundaries of one print, but give it a whirl. Create a scene you love! 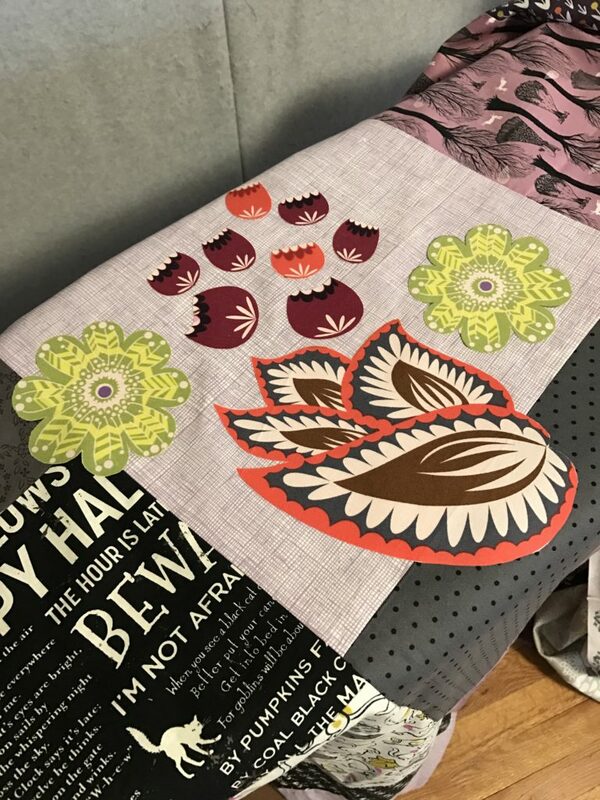 Crafty Planner Podcast – Listen to me! I love it! I’ve been enjoying applique lately, but really love the idea of cutting from large scale fabric. The effect is lovely!